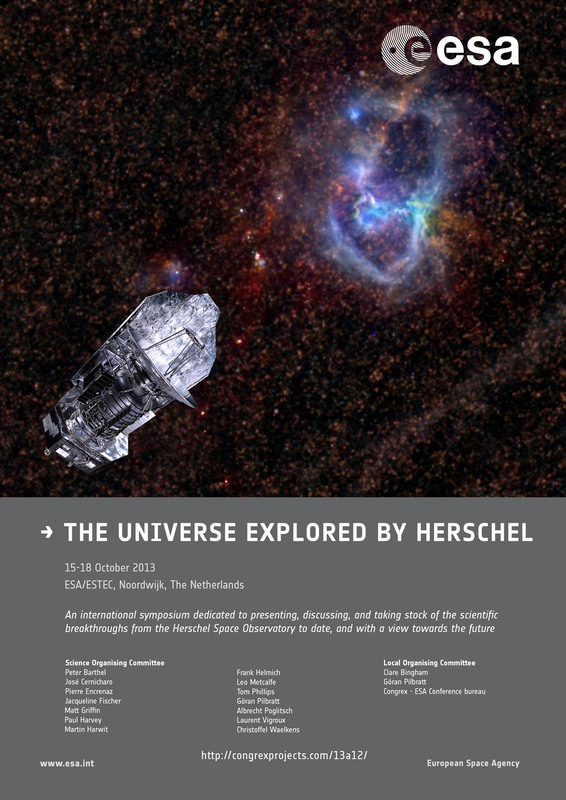 The Herschel First Results Symposium was held in May 2010. A lot has been achieved since, the overall objective of The Universe Explored by Herschel meeting was to present, discuss, and take stock of the scientific results based on Herschel. 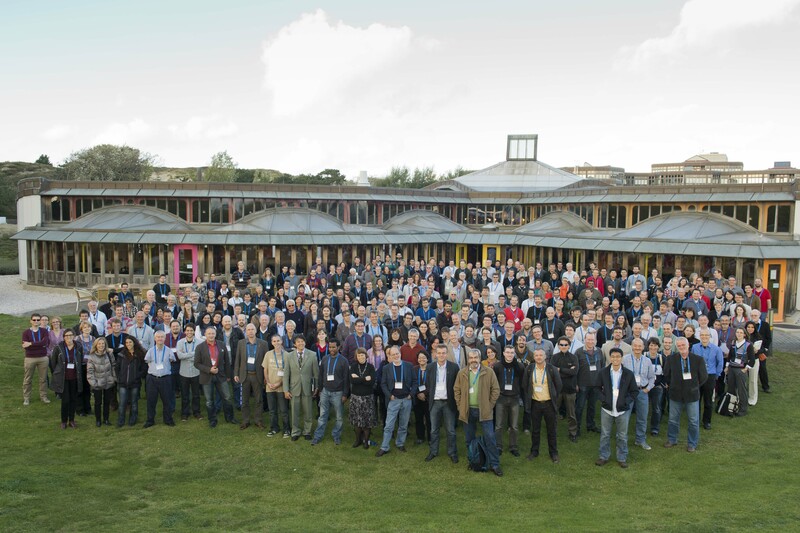 The invited talks were complemented by 102 contributed talks and about 200 posters, preceded by a welcome and an introductory talk, and followed by five short summary presentations, one in each of the science areas. A 'Herschel desk' was provided to demonstrate the Herschel Science Archive and its contents as well as the HIPE data processing software, and to directly interact the participants. The symposium featured 5 invited and 102 contributed talks, preceded by welcome and introduction talks, and followed by 5 wrap-up talks, a total of 114 oral presentations. P01 SUPREME: A Super-Resolution Map-making Method For Extended Emission - Ayasso, H.
P02 Herschel Sources In The SIMES Survey - Baronchelli, I.
P03 PEP: The Galaxies Dominating the Cosmic IR Background and their Molecular Gas Mass Function. - Berta, S.
P04 Dust is Very Rare at Low Metallicities: The Extremely Low Dust Content in I Zw 18 - Bolatto, A.
P05 On the Relation Between Dust, Gas, and Attenuation in Galaxies at kpc Acales - Boquien, M.
P06 HERMES: Unveiling Obscured Star Formation in Ultraviolet Selected Galaxies from z=1.5 to z=4 - Buat, V.
P07 Terra Incognita: The First Insight into the Gas Properties of the Host Galaxy GRB 980425 - Castro Cerón, J.M. P08 Multivariate Analysis of the SPIRE Maps: Using Principle Component Analysis as a Basis for P(D) Fluctuation Analysis - Clarke, C. L.
P09 A Local Universe View at the ISM of high-z Galaxies: Fine Structure Lines and Continuum of Lyman Break Analogs - Contursi, A.
P10 Are Ly-alpha Blobs indeed the Sites of very Active Star Formation?- Dannerbauer, H.
P11 MAMBO 1.2mm Observation of the Brightest Herschel-Selected Submm Galaxies - Dannerbauer, H.
P12 Explaining the [CII]157.7µm Deficit in Luminous Infrared Galaxie - First Results from a Herschel/PACS Study of the GOALS - Diaz Santos, T.
P13 Comparison of Star Formation Rates from Hα and Infrared Luminosity as seen by Herschel - Domínguez Sánchez, H.
P14 Herschel Observations of Water and OH in Zw049.057 and Arp299 - Falstad, N.
P15 Multiwavelength Characterisation of the First Planck high-z Candidate - Flores-Cacho, I.
P16 SPIRE Fourier Transform Spectroscopy Of Strongly Lensed DSFGs - George, R.
P17 Exploring the Star Formation Laws of IR-Luminous Galaxies with Herschel - Greve, T.
P18 The Herschel PEP/HerMES Luminosity Function: Probing the Evolution of PACS selected Galaxies to z~4 - Gruppioni, C.
P19 Herschel-SPIRE Observations of Planck Sources: Detailed Characterization - Guery, D.
P20 How to dig Science out of Faint FTS Observations of Dust Obscured Galaxies - Hopwood, R.
P21 The Herschel View of Dust in GRB Host Galaxies - Hunt, L. K.
P22 Herschel-ATLAS: The 100µm and 160µm PACS Population over 160 sq.deg. - Ibar, E.
P23 The Origin and Evolution of (Ultra)Luminous Infrared Galaxies Over Cosmic Time - Kartaltepe, J.
P24 Submm-bright QSOs at z ~2: Signposts of Co-Evolution at high z - Khan-Ali, A.
P25 Characterizing the Spectral Energy Distributions of (Ultra) Luminous Infrared Galaxies from z=0.5-4 - Kirkpatrick, A.
P26 Infrared SEDs and Morphologies of Herschel Selected Galaxies in the COSMOS Field - Lee, N.
P27 Modeling the Dust Emission in (U)LIRGs - Leonidaki, I.
P28 Warm Molecular Gas in Luminous Infrared Galaxies: Gas and Dust Heating and the Roles of Star Formation and AGN - Lu, N.
P29 The Evolving ISM of Star Forming Galaxies Over the Last 10 Billion Years - Magdis, G. E.
P30 Cosmic Dichotomy in the Hosts of Star-Forming Systems at low and high Redshifts - Magliocchetti, M. et al. P31 The Deepest Herschel View of the Universe: Cosmic Star-Formation History and Dust Temperatures of Galaxies up to z=2 - Magnelli, B.
P32 Dusty Gems: Zooming in on the Most Intensely Star-Forming Regions in the early Universe found with Planck and Herschel - Nesvadba, N.
P33 The Herschel Multi-Tiered Extragalactic Survey: HerMES - Oliver, S.
P34 Herschel has Revealed the Large Amount of H2O in the Young Universe - Omont, A.
P35 QSOs, Winds and Star Formation: X-Ray and Submillimetre Observations of AGN in the Epoch of Galaxy Formation. - Page, M.
P36 SPIRE Spectroscopy of Local ULIRGs from the HERUS Programme - Pearson, C.
P37 Rapid Host Galaxy Growth in Powerful Radio-Loud AGNs: The Herschel View - Podigachoski, P.
P38 The Herschel View of Star Formation within Massive Merging Clusters - Rawle, T.
P39 Searching for Protoclusters in the Far-Infrared with Herschel/SPIRE - Rigby, E.
P40 HeDaM: The Herschel Database in Marseille - Roehlly, Y.
P41 H-ATLAS: Properties of Dusty Massive Galaxies at low and High Redshifts - Rowlands, K.
P42 Seyfert and Star Formation Activity in the Far Infrared: Results from the SAFIR Project. - Castillo-Fraile, M.
P43 Dust-Obscured Star Formation in High-Redshift Galaxy Clusters - Santos, J. S.
P44 New Insight into Star Formation Properties at z~2-3 from Lensed Galaxies - Schaerer, D.
P45 Testing Star Formation Histories and Attenuation Laws of Distant Star Forming Galaxies - Sklias, P.
P46 Properties of Star Formation and Dust Emission in Interacting Galaxies from Modeling of the UV to FIR SEDs and Simulations - Smith, H. A.
P47 Diagnostics of AGN-driven Molecular Outflows in ULIRGs from PACS Observations of OH at 119 Microns - Spoon, H.
P48 The Herschel Census of Infrared SEDs through Cosmic Time - Symeonidis, M.
P49 Dusty Feedback from Massive Black Holes in two Elliptical Galaxies - Temi, P.
P50 The Evolution of the FIR/SMM Luminosity Function and of the Cosmic Star Formation Rate Density of SPIRE-Selected Galaxies - Vaccari, M.
P51 Proto-Clusters of Galaxies and Overdensities of Star-Forming Galaxies: The Case of MRC1138-26 - the Spiderweb - Valtchanov, I.
P52 Gravitationally Lensed Galaxies Detected by HerMES - Wardlow, J.
P53 Star Formation Enhancement In Close Major-Merger Pairs with z < 1 - Xu, C.K. P54 Obscured AGN in a Strongly Lensed Giant Arc Revealed with Herschel - Zamojski, M.
P55 The Physical Condition of Gas in NGC 3184 - Abdullah, A.S.
P56 Dust Emission at Planck Millimetre Wavelengths in the Galactic Plane - Alves, M.
P57 Evolution of Dust in Photodissociation Regions from PACS and SPIRE Photometric Observations. - Arab, H.
P58 Dynamical Properties of Photo-Dissociation Regions as seen with Herschel/HIFI - Berne, O.
P59 The State of the Gas and its Relation to Star Formation at Low Metallicity - Bolatto, A. D.
P60 Deuteration of Ammonia in the Solar-Type Class 0 Protostar IRAS16293 - Bottinelli, S.
P61 A Non-Equilibrium Ortho-to-Para Ratio of Water in the Orion PDR as seen by Herschel/HIFI - Choi, Y.
P62 Deuterated Water in Star-Forming Regions - Coutens, A.
P63 When Twins are not Identical: A HIFI Scan of IRAS 15194-5115, the Stellar Twin of IRC +10216 - De Beck, E.
P64 HCN Emission around IRC+10216: The HIFI View - De Beck, E.
P65 Herschel Observations of the Sgr B2: Hydrides, warm CO and cold Dust - Etxaluze, M.
P66 Chemistry and Dynamics of the Ultracompact HII Region Monoceros R2: The Herschel View - Fuente, A.
P67 Herschel Spectral-Mapping of Orion Molecular Cloud - Goicoechea, J.R.
P69 Gas Morphology and Energetics in bright Photodissociation Regions - Joblin, C.
P70 Isolating Gaussian from Non-Gaussian Fluctuations in Herschel Maps: Separating Turbulence from Other Physical Processes. - Joncas, G.
P71 A Detailed Herschel View of Chlorine in a Protostellar Core - Kama, M.
P72 Far-infrared Molecular Lines from low- to high-mass Star Forming Regions observed with Herschel - Karska, A.
P73 Physical Structures of PDRs derived by Dust and Gas Observations with SPIRE and PACS - Koehler, M.
P74 The Herschel-HIFI Observation of Water and Molecular Oxygen in ñ Oph A. - Larsson, B.
P75 Peering into Protostellar Shocks with Herschel: a New View - Le Floch, B.
P76 A Dedicated Study of Deuteration in the Intermediate-Mass Protostar OMC- 2 FIR 4 - Lopez-Sepulcre, A.
P77 From a Molecular Ridge to "fake" Filaments: The Impact of Massive Star Ionisation - Minier, V.
P78 The Socio-Technological History of the Herschel Space Observatory - Minier, V.
P79 Every Cloud has a C-H Lining: A Study of Extended CH, CH+, and C+ as Tracers of Initial Hydrocarbon Chemistry in Orion KL - Morris, P.
P80 Herschel Maps of the hidden Warm Gas in the Youngest Protostellar Outflows - Nisini, B.
P81 PACS and SPIRE Spectroscopy of the Carina Region - Onaka, T.
P82 The Interaction of Heating and Gas Dynamics in PDRs - Ossenkopf, V.
P83 Cosmic-Ray Propagation in the Interstellar Medium: How Theoretical Modelling Helps in Interpreting Observations - Padovani, M.
P84 Spitzer and Herschel Multiwavelength Characterization of the Dust Content of Evolved HII Regions - Paladini, R.
P85 Unveiling the Origin and Excitation Mechanisms of the Warm CO, OH and CH+ - Parikka, A.
P86 Component Separation in Herschel Maps based on the Coherence Analysis with Atomic and Molecular Gas - Robitaille, J.-F.
P87 Hot CO in DR21 - Roellig, M.
P88 First Results from the Molecular Line Survey with HSO/HIFI of the Rotten Egg Nebula. - Sanchez-Contreras, C.
P89 A Study of Water Excitation in the IRAS4A Protostellar Outflow with Herschel - Santangelo, G.
P90 Evolution in the Earliest Stages of High Mass Star Formation as see by HIFI - Shipman, R.
P91 Bipolar Outflow Studies with Herschel - Tafalla, M.
P92 Modelling of the Ice Deuteration in the Early Stages of Low-Mass Star Formation - Taquet, V.
P93 The Inversion Method Approach to Derive 3D Dust Emission Properties in the ISM: The Hi-GAL Field Centred on (l,b)=(30,0). - Traficante, A.
P94 Herschel Observations of Planetary Nebulae in the MESS Program - van Hoof, P.A.M.
P95 Chemistry and Physics in Intermediate Luminosity Star-Forming Micro-Clusters - van Kempen, T.
P96 The OH Far-Infrared Spectrum of Embedded Protostars Revealed by Herschel - Wampfler, S. F.
P98 Depletion Cores - the O2 hideout? - Wirström, E.S. P99 Analysis of Clump Mass Spectra of OMC1 using the Herschel SPIRE Archival Data - Youn, S.
P100 Evolution of Dust Properties in a Dense Filament of the Taurus Molecular Complex (L1506) - Ysard, N.
P101 A Herschel Survey of the [N II] 205 Î¼m Emission in Local Luminous Infrared Galaxies - Zhao, Y.
P1 The FIR and the Bivariate K-Band-FIR Luminosity Functions of the local Herschel Reference Survey (HRS) Galaxy Sample - Andreani, P.
P2 Heating and Cooling of the ISM in NGC 1097 - Beirao, P.
P3 Extending the Analysis of Dust Heating in Nearby Galaxies with Herschel - Bendo, G.
P4 Tracing PDR Properties and Structure in the Closest Low Metallicity Galaxy: 30Doradus in the LMC - Chevance, M.
P5 [CII] and Hydrogen Species in LITTLE THINGS Dwarf Galaxies: The Extremely Metal-Poor Regime - Cigan, P.
P6 The ISM Structure of Low-Metallicity Dwarf Galaxies. - Cormier, D.
P7 A Two-Parameter Model for the Infrared/Submillimeter/Radio Spectral Energy Distributions of Galaxies and AGN - Dale, D.
P8 The Challenge of Radiative Transfer in Edge-On Spiral Galaxies: the HEROES Sample. - De Geyter, G.
P9 The Reliability of FIR Line Emission as SFR Indicator - De Looze, I.
P10 High-Resolution, 3D Radiative Transfer Modeling of M51 - De Looze, I.
P11 A Herschel Study of Local Major-Merger Galaxy Pairs - Domingue, D.
P12 Probing the Properties of the Interstellar Medium of Nearby Galaxies with Herschel - Galametz, M.
P13 H-ATLAS : SDSS Cross-Correlation induced by Weak Lensing - Gonzalez-Nuevo, J.
P14 [CII] 158 Micron Line Emission as a Star Formation Rate Tracer - Herrera-Camus, R.
P15 New Herschel Multi-wavelength Extragalactic Survey of Edge-on Spirals (NHEMESES) - Holwerda, B.W. P16 Resolved Dust Analysis of Nearby Edge-On Galaxy NGC 891 - Hughes, T.
P17 Early-Type Galaxies: Herschel SPIRE Spectroscopy & Star Formation - Lapham, R.
P18 Dust and Star Formation in the Tidal Dwarf Galaxy in Arp 245 - Lisenfeld, U.
P19 Extragalactic HF Molecular Line Observations from Herschel SPIRE and HIFI Spectroscopy. - Lord, S.
P20 Spectrally Resolved [CII] Spectroscopy of M33 with HIFI: HerM33es - Mookerjea, B.
P21 PACS Spectroscopy Along the Major Axis of M33 - Nikola, T.
P22 Dust Properties in Dwarf Galaxies as Uncovered by the Dwarf Galaxies Survey with Herschel - Remy-Ruyer, A.
P23 Zero-Point Correction for Herschel-SPIRE Maps through Planck-HFI Cross Calibration - Schulz, B.
P24 Herschel Photometry and Diffuse Emission Analysis with BoloSource() Code - Vavrek, R.
P25 Physics Revealed by Fine-Structure Lines and Broad Range CO Ladders from M83 - Wu, R.
P26 Early-Type Galaxies: Herschel Spectroscopy & the Cold and Warm Interstellar Medium - Young, L.
P27 A Deep 70 Micrometer Study of Cold Circumstellar Disks in Rho Oph - Abraham, P.
P28 A Catalogue of Protostars embedded in the IRDCs in the Galactic Range 15° ≤ l ≤ 55° - Traficante, A.
P29 Herschel Survey of Brown Dwarf Disks in Rho Ophiuchi - Alves de Oliveira, C.
P30 Characterizing Interstellar Filaments with Herschel in Nearby Clouds: Insights into the Initial Conditions for Star Formation - Arzoumanian, D.
P31 Filaments and Compact Sources Distribution in the Lupus Star Forming Region - Benedettini, M.
P32 Far-IR Photometric and Spectroscopic Monitoring of Protostars in Orion A - Billot, N.
P33 Clustering Properties of Herschel Compact Sources in the Galactic Plane - Billot, N.
P34 Study of the 69 Micron Band of Crystalline Olivine around Evolved Stars - Blommaert, J.
P35 Revealing Astrospheres Around Young and Old Stars in the Far Infra-Red - Cox, N.
P36 Filamentary Structure in the Musca and Chamaeleon Dark Clouds - Cox, N.
P37 The Herschel View of Yellow Hypergiants as post-Red Supergiants in a pre-Luminous Blue Variable Phase. - Cox, N.
P38 Comet-Like Mineralogy of Olivine Crystals in an Extrasolar Proto-Kuiper Belt - de Vries, B.L. P39 Star Formation in the Carina Arm as seen by Herschel: Pre- and Proto-Stellar Clumps in the 289° ≤ l ≤ 307° Portion of the Hi-GAL Survey - Elia, D.
P40 The Case of the Exploding Star: V838 Mon Observed with Herschel - Exter, K.
P41 Tracing Protostellar Envelope Evolution in Orion with Herschel - Fischer, W.
P42 An Independent Distance Estimate to CW Leonis - Groenewegen, M.
P43 The Homunculus of Eta Carinae: Anomalous N- and 13C-Molecular and HI Emissions - Gull, T.
P44 Observations of THz Ammonia Absorption tracing Infall in High-Mass Star Forming Region G34.26+0.15 - Hajigholi, M.
P45 The Dust and Gas Structure in the S 140 Cluster - Harvey, P.
P46 Nitrogen Hydrides in IRDCs: Exploring the Initial Conditions of IRDC Core Formation - Jimenez-Serra, I.
P47 Superwinds from Extreme OH/IR Stars - Justtanont, Kay. P48 N-Bearing Molecules in the Protostellar Envelope of AFGL 2591 - Kazmierczak, M.
P49 Herschel's View on Detached Shells Around Evolved Stars - Mecina, M.
P50 Dark Shadows in T Tauri Disks: Accretion-Related Changes Indicated by Infrared Variability - Kóspál, A.
P51 High Mass Star Formation Revealed by Herschel PACS Data of WISH - Kwon, W.
P52 The Herschel Planetary Nebulae Survey: HerPlaNS - Ladjal, D.
P53 Transition from Atomic to Molecular Interstellar Medium - Li, D.
P54 The Transition from pre- to Protostellar Cores in EPoS Sources: Herschel Continuum and Ground-Based Molecular Line Observations in Concert - Linz, H.
P55 Herschel Reveals the Ejecta of Wolf-Rayet Stars - Marston, A.
P56 SPIRE and PACS Spectroscopic Observations of the Red Supergiant VY CMa - Matsuura, M.
P57 Unveiling the Formation of Stars and Planets in Chamaeleon with Herschel - Merín, B.
P58 Herschel/PACS Photometry of Transiting Planet Host Stars with Candidate Warm Debris Disks - Merín, B.
P59 B68 - The HERSCHEL View: Dust Temperatures and Densities - Nielbock, M.
P60 The Shape of the Mass-Function of Dense Cores in Two Hi-GAL Fields - Olmi, L.
P62 The Star-Forming Region in Perseus: The Results of PACS/SPIRE Observations - Pezzuto, S.
P63 Herschel Observations of the Massive Young Cluster in Monoceros R2 - Rayner, T.
P64 Physical Properties of the Dense High-Latitude Clump MCLD 126.6+24.5 - Ristorcelli, I.
P65 Galactic Star Formation: From Diffuse High-Latitude Environments to Clusters of High-Mass Stars - Rivera-Ingraham, A.
P66 Herschel Observations of Gas in Debris Disks from the GASPS Key Programme - Roberge, A.
P67 Reconstructing Density and Temperature Structures of Cores from Herschel Data Using Abel's Integral Transformation. - Roy, A.
P68 The Star Forming Region NGC 6334 as Seen by Herschel-HOBYS - Russeil, D.
P69 A Herschel and BIMA Study of the Sequential Star Formation in the W48A Star-Forming Region - Rygl, K., L., J.
P70 Star Formation from small to large Scale: Studying the Role and Impact of the Environment in the Herschel Era. - Samal, M.
P71 High-J CO from Low- To High-Mass: The Dynamics in Protostellar Envelopes - San Jose-Garcia, I.
P72 Herschel/PACS Survey of Protoplanetary Disks in Taurus/Auriga -- Observations of [OI] and [CII], and far Infrared Continuum - Sandell, G.
P73 The Identification of Filaments on Far-Infrared and Submillimeter Images: Morphological Analysis of Hi-GAL Maps - Schisano, E.
P74 Observations of the Circumstellar Ammonia Lines in Carbon-Rich AGB Stars by Herschel Space Observatory. - Schmidt, M. R.
P75 Herschel-Resolved Debris Disks around nearby FGK Stars: Models and Comparison with HST Images - Stapelfeldt, K.
P76 The Discovery of Extremely Young Protostars in Orion with Herschel and APEX - Stutz, A.
P77 Herschel, Spitzer and near-IR Imaging and Spectroscopy of the Star Forming Region RCW 121 (IRAS17149-3916) - Tapia, M.
P78 Time Variability of Thermal Molecular Emission in IRC+10216 - Teyssier, D.
P79 The Massive Dense Cores in NGC 6334 and NGC 6357 : The Herschel-HOBYS View - Tigé, J.
P80 Star Formation in Planck Cold Clouds - from Dense Cores to YSOs - Toth, L. V.
P81 Herschel Observations of Nebulae Ejected by Massive Evolved Stars - Vamvatira-Nakou, C.
P82 Herschel Imaging of Planetary Nebulae - Van de Steene, G. C.
P83 An Analysis of Star Formation with Herschel in the Hi-GAL Survey. II. The Tips of the Galactic Bar. - Veneziani, M.
P84 Is there Something Like a Typical T Tauri Disk in Taurus? - Vicente, S.
P85 A Herschel View of the Photoevaporation and Chemistry of Gas in Proplyds - Vicente, S.
P86 Herschel Observations of Pre-Stellar Cores compared to Data from SCUBA2 - Ward-Thompson, D.
P87 A Water Survey of Massive Star Forming Clumps in the Inner Galaxy - Wyrowski, F.
P89 Observations of Ammonia in Comets with Herschel - Biver, N.
P90 Herschel Measurements of the D/H ratio in Cometary Water - Bockelee-Morvan, D.
P91 The Origin of External Oxygen in Jupiter and Saturn's Environments - Cavalié, T.
P92 Search for Water and Upper Limit to the Outgassing Rate of the Main-Belt Comet 176P/LINEAR using Herschel/HIFI - de Val-Borro, M.
P93 A Search for Latitudinal and Seasonal Variations of Molecular Oxygen on Mars using Herschel/HIFI - Encrenaz, T.
P94 Results of the HssO Key Programme - Hartogh, P.
P95 The Thermal Emission of the Eris-Dysnomia System as seen by Herschel/PACS - Kiss, C.
P96 Herschel/PACS Observations of the "Supercomet" Candidates 2012 DR30 and 2013 AZ60 - Kiss, C.
P97 Thermal Properties of Kuiper Belt Objects and Centaurs from Combined Herschel and Spitzer Observations - Lellouch, E.
P98 The Phoebe Ring as observed by Herschel - Marton, G.
P99 Comet Dust Profiles from PACS Images Obtained in the Framework of the HssO Project - Opitom, C.
P100 Herschel Observations of Near Earth Objects : Encounters with Spacecraft and with the Earth - O'Rourke, L.
P101 Herschel Observations of asteroid 21 Lutetia - the Rosetta Flyby Target - O'Rourke, L.
P102 Thermal Light Curves of Trans-Neptunian Objects and Centaurs with Herschel Space Observatory - Santos-Sanz, P.
P103 Comet 10P/Tempel 2 Outgassing Observed with Herschel Space Observatory - Szutowicz, S.